Over the past several builds, I’ve been messing around with various techniques for building up paint in layers for added tonal depth and complexity. 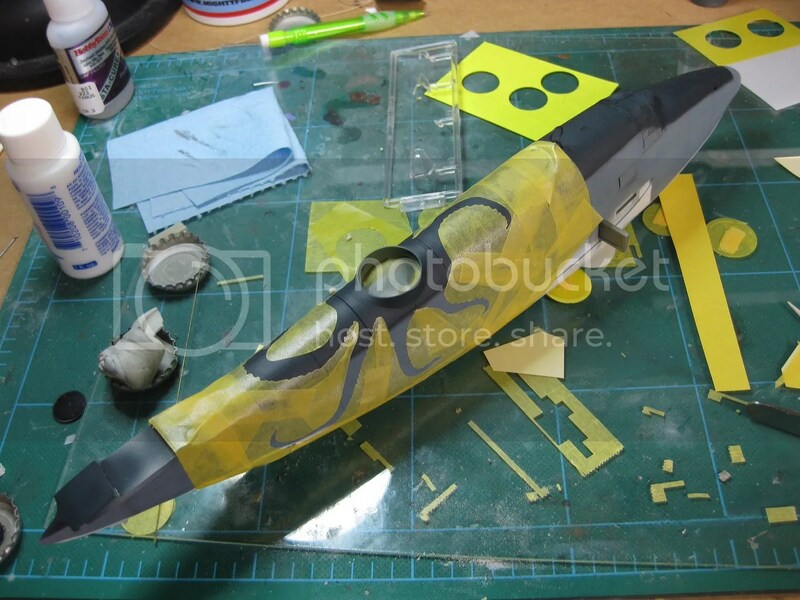 On the Revell P-47 Razorback and PCM Fiat G.55, I experimented slightly with some streaked, messy pre-shading. 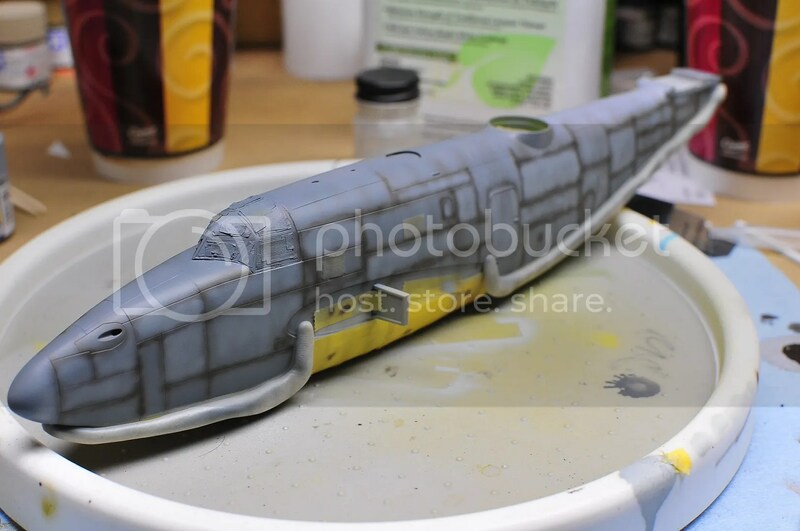 With the Hasegawa N1K1 George, I took the first dive into salt weathering. 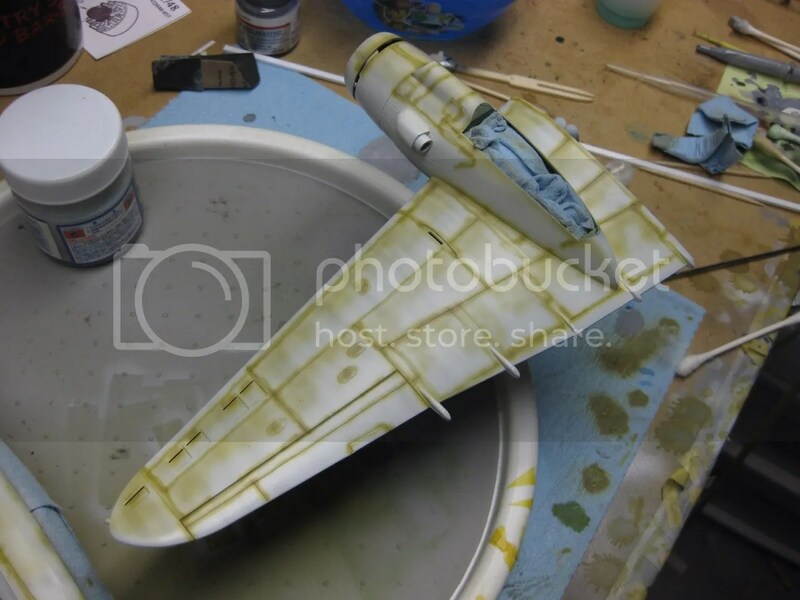 This time around, the combination of the U.S. mid-war tri-color camoflage and the harsh environs of the South Pacific open the door wide open to all kinds of fading and weathering, and I’m planning to bring together several techniques to see how they play together. I’m not facing a natural metal finish this time, so I decided to go back to my old favorite, Model Master enamel primer. The stuff goes down very well and, if you’re using it under enamels, has and provides great bite. Moving from bottom to top, the first color of the U.S. Navy’s tricolor scheme is white. Since going with a straight white is kind of like going with straight black – simply overpowering – I opted for Gunze Sangyo Offwhite, which is pleasingly dirtied up a bit. It also has the best coverage of any white I’ve ever used, which makes it a champ in my book. I started with an overall base coat, then moved on to shading. Since white doesn’t cover very well, I went with lighter tones for shading – namely Gunze Middlestone cut with some Olive Drab. Neutral Gray was used for some airflow streaking to complement the shading work. Thinned Gunze Offwhite went over the shading until it was largely blended in. I intentionally stopped maybe half a coat ahead of where I normally would, since in my experience subsequent clear coats and weathering will obscure quite a bit. The result is a dirty, grimy white that you’d expect of a military aircraft operating off a primitive island airstrip. After putting down some blue for a uniform base, I pre-shaded with Model Master Burnt Umber, then added some streaking with the same, and lightened certain panels with an Intermediate Blue/Light Gray. When I started misting the blending coat on top, I had real problems with paint performance. Thinned into a ratio that wouldn’t just immediately cover everything, the Model Master paint + thinner got very “runny”. So, on a whim, I added some Mr. Leveling Thinner to the proceedings. And it worked perfectly, killing the runniness entirely. I’ll be trying it as a thinner with Model Master enamels to see how it performs both as an additive and a main thinner, but in this instance, it worked great! 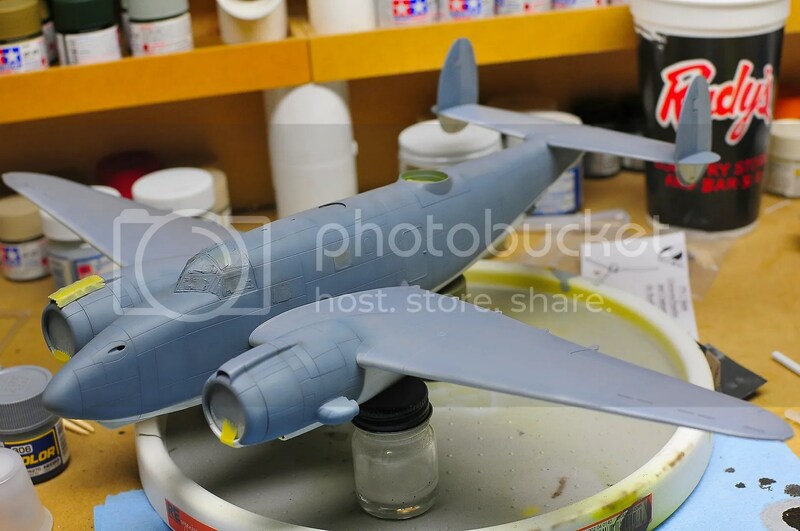 The Sea Blue followed much the same process as the intermediate blue – masking with white tack putty, laying down a base layer, shading (black and a Sea Blue/Light Gray mix), then blending it in with a thinned Sea Blue. A few Venturas wore a unique and highly distinctive piece of artwork – a massive octopus design, centered on the dorsal turret, with the arms extending out and wrapping along the fuselage. The Revell kit and Zotz sheet both provide decals for the octopus, but it’s such a big design, and has to surround the weird surfaces around the turret fairing, that I decided it had to be painted. 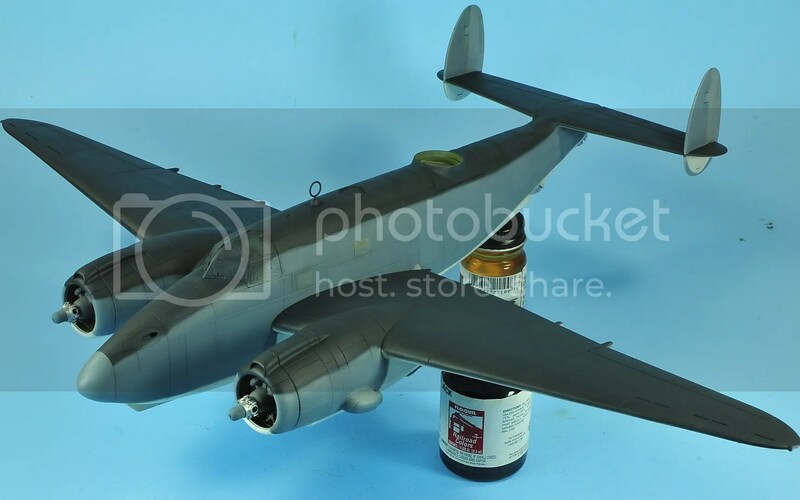 I first heard of Maketar right around the time I started the PV-1. 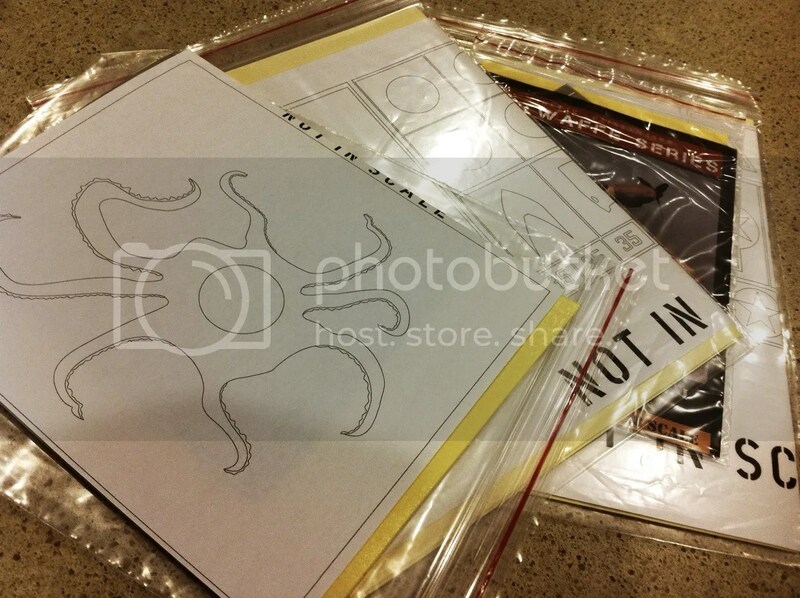 In addition to offering several awesome masking sets – and sheets of yellow kabuki masking tape that you can run through a laser printer (yes, I know want a laser printer) – Alek at Maketar also provides custom mask services. 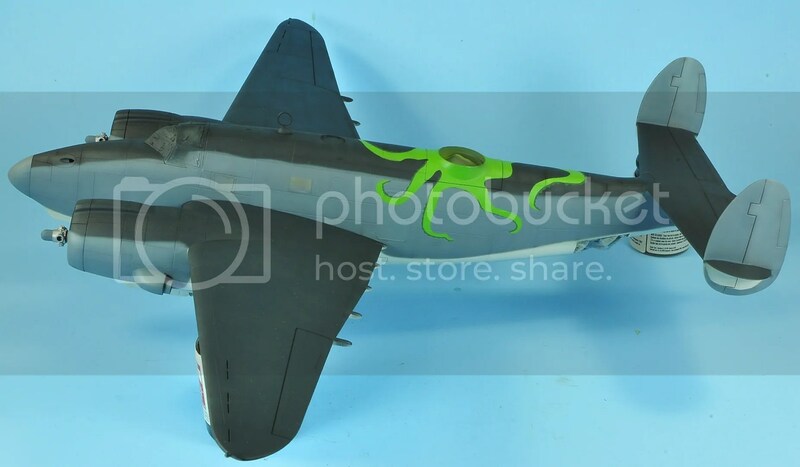 I’d been planning to contact him regarding some other builds anyway, so I brought up the PV-1 octopus. About a week or so after paying, it and the other mask sets showed up in the mail looking very nice. 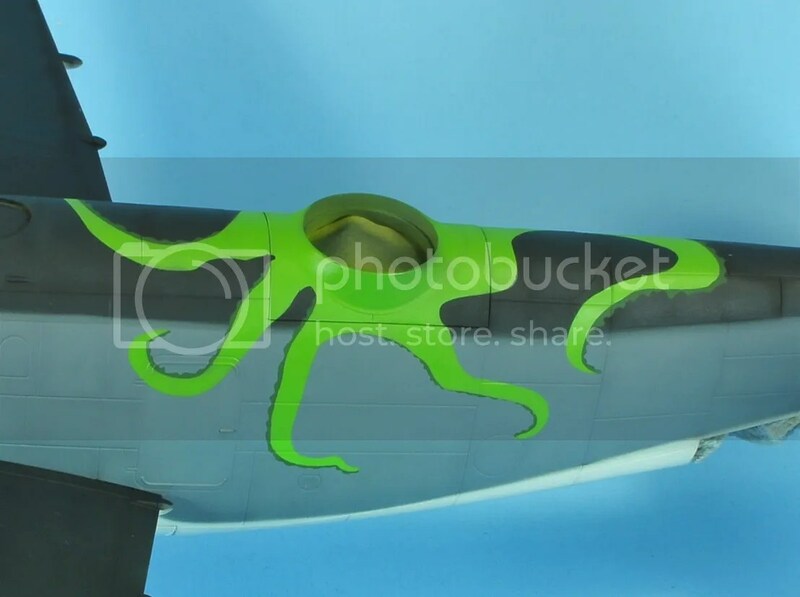 Even with a paint instead of a decal, the octopus design is a daunting thing to apply to a rounded fuselage. I decided to put down the octopus itself first, to mark positions, then place the mask around it. Masking’s all about painting in layers, and I used Model Master Euro Dark Green for the first layer of the octopus arms. 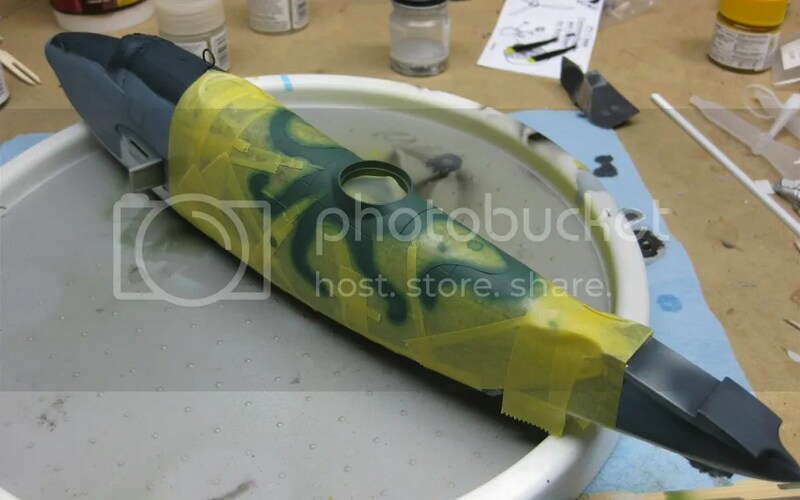 This will serve as both the dark green of the arm “edges”, and as shading for the second layer. 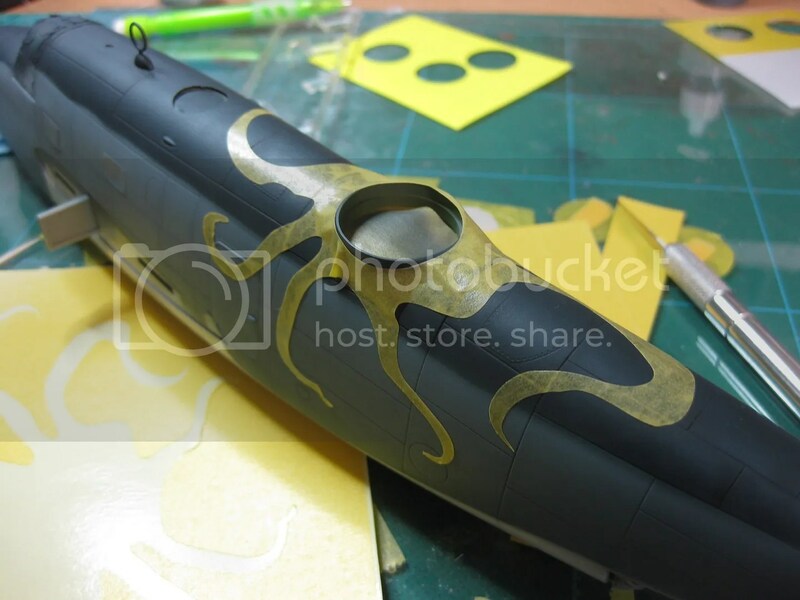 For the second layer – the main arms, I used Model Master Willow Green. 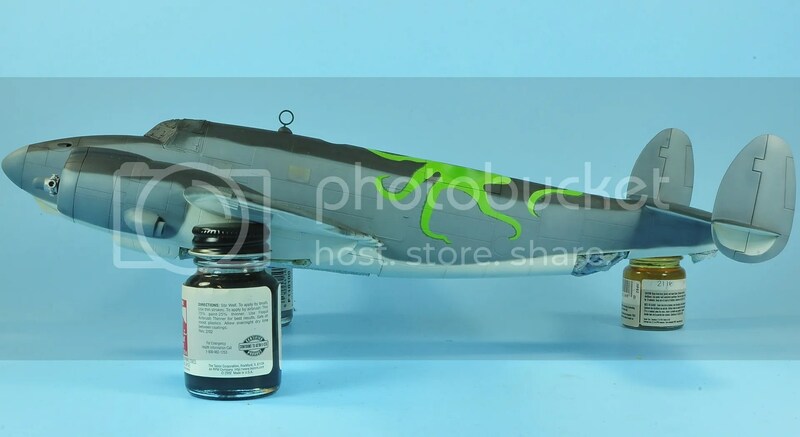 Willow Green was a paint used in the pre-war, “yellow wings” era, and it’s reasonable that the crews would have tapped into old stocks of the paint for their octopus schemes. The Willow Green’s a bit dark in the bottle, so I added some Flat White to lighten it a bit. 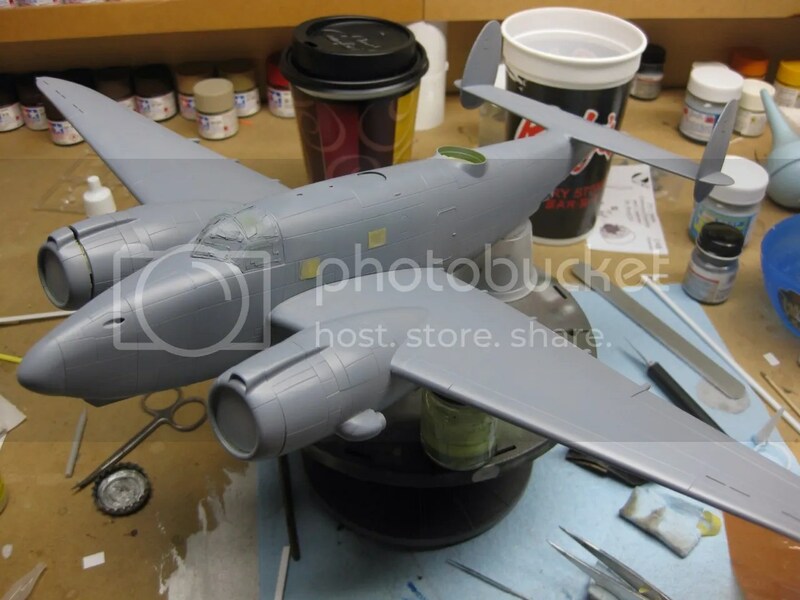 And here’s the fully-painted PV-1 Ventura. Stay tuned for decals and weathering! Hey Roy – thanks for the comment! Unfortunately, I tend to stay away from Model Master Acryl (just never liked the way it handles) so I can’t say for certain, but it sounds like it shrank as it dried or something. I’d recommend trying with Testors’ universal acrylic thinner – I believe it’s glycol based rather than alcohol-based, but it works really well with Vallejo and other alcohol-phobic acrylics. looking good doogs! how did you get the MM enamels to spray so nice? looks like silk. im assuming it’s the enamel primer? roy- MM acrylics are very thin from the bottle most of the time. they have a consistency problem also. some are thicker then other bottles. MM acrylics have no bite so they will need a good prime to stick to. yep, he used MM enamel primer. real good stuff. even itself out pretty good. 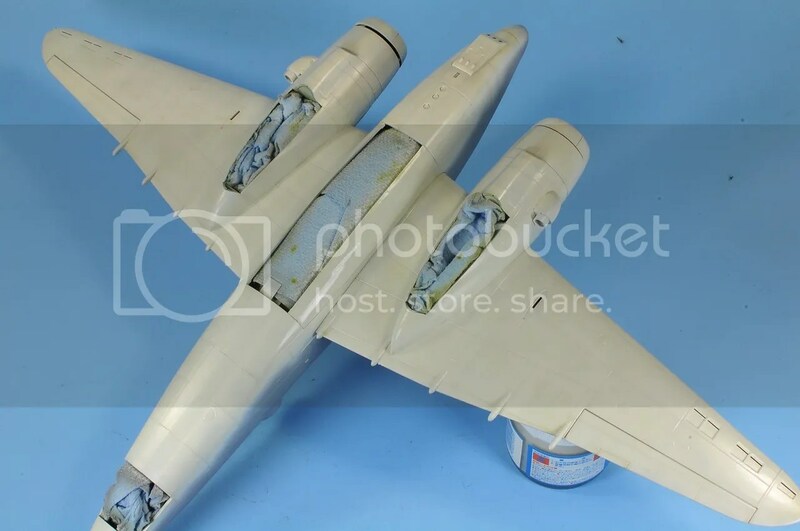 i actually used this primer over the weekend for my F-5E build. i heard it gives a beautiful shine when used with enamels.